SOS First Aid and Safety Training is Mississauga, Oakville and Brampton’s number one choice for Red Cross first aid training and CPR/AED training. 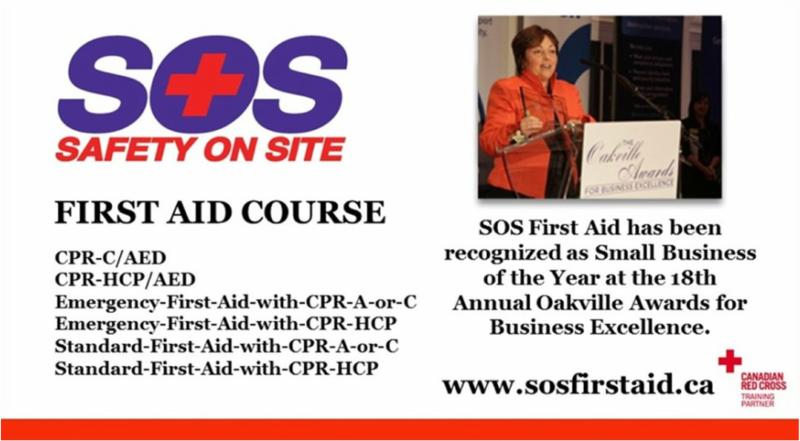 SOS First Aid won Oakville’s Small Business of the Year Award and was recognized as the Top Canadian Red Cross Training Partner in the West-Central Region. Passionate, knowledgeable and friendly, it is easy to see why SOS First Aid instructors are the best in the industry. Our instructors care about our students’ learning, providing innovative first aid and CPR training that is simple, hands-on and easy for students to understand. Students leave our classes feeling confident.